The lifeguards along a stretch of Malibu beach kill a shark that is threatening swimmers. A marine biologist identifies it as a prehistoric goblin shark. This has been unearthed from the deep by an earthquake. The earthquake now brings a tsunami. Amid the panicked evacuation, several of the lifeguards take refuge inside the lifeguard station. However, when this subsides, they now find that they are stranded in the midst of the floodwaters a quarter mile away from the new shoreline. Moreover, the tsunami has brought with it dozens of goblin sharks that are determined to break into the flimsy hut and devour them. The killer shark film has almost become a genre unto itself in the 2000s. The genre was started by Jaws (1975), which produced several sequels and a great many cheap imitators. This steadily continued throughout the 1990s and early 2000s with a number of B-budget video-released films. By about the point of Deep Blue Sea (1999), which did receive a theatrical release, and most certainly a decade later by the time of the B movies Shark in Venice (2008) and Mega Shark vs Giant Octopus (2009), the killer shark film came with tongue planted firmly in cheek. 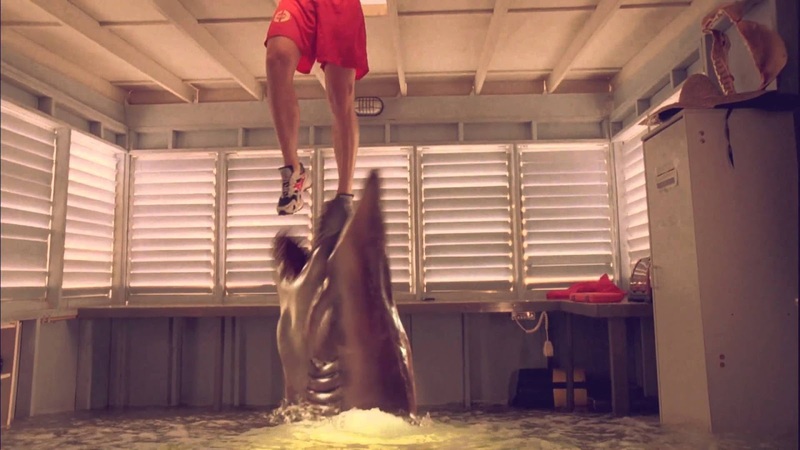 Of recent, the killer shark film has been typified by the bad movie phenomenon of Sharknado (2013), although that was the visible tip of iceberg of killer shark films that seemed to be trying to play themselves as absurdly as possible – as witness titles such as Dinoshark (2010), Sharktopus (2010), Sand Sharks (2011), Snow Shark: Ancient Snow Beast (2011), Swamp Shark (2011), Bait (2012), Jersey Shore Shark Attack (2012), Jurassic Shark (2012), 2-Headed Shark Attack (2012), Avalanche Sharks (2013), 90210 Shark Attack (2014), Raiders of the Lost Shark (2015), Roboshark (2015), Shark Exorcist (2015), Zombie Shark (2015), Atomic Shark (2016), Ice Sharks (2016), Ozark Sharks (2016), Planet of the Sharks (2016), Sharkansas Women’s Prison Massacre (2016) and Trailer Park Shark (2017), among others. 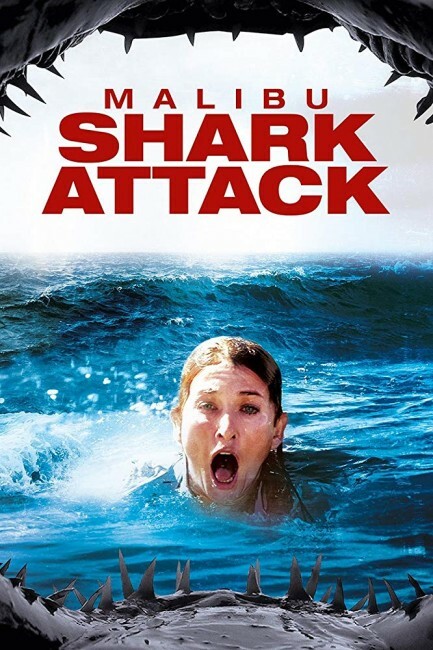 In some dvd releases of Malibu Shark Attack, there was the attempt to jump aboard this fad and remarket the film under the title Mega Shark of Malibu to capitalise on the success of The Asylum’s Mega Shark vs Giant Octopus. Malibu Shark Attack comes from South African director David Lister who has made a good deal of cheap action, family entertainment and genre material for video and cable release as witness titles such as The Rutanga Tapes/Killer Instinct (1990), The Last Leprechaun (1998), Dazzle (1999), The Meeksville Ghost (2001), The Sorcerer’s Apprentice (2002), and two versions of the fairytale Beauty and the Beast (2005) and Beauty and the Beast (2009). There is also the name of Brian Trenchard-Smith on the credits, a director who was part of the classic Ozploitation cycle with films such as Turkey Shoot (1983) and Dead-End Drive-In (1986), and in more recent years has taken to directing some incredibly tatty dreck for the US cable market with the likes of Tyrannosaurus Azteca (2007) and Arctic Blast (2010). If one considers that Malibu Shark Attack gives all impression of being a film that Trenchard-Smith considered too cheap to direct himself, one’s hopes do not rise particularly high. Nor does one’s hopes rise after the opening credits end at the sight of the almost completely unknown Australian cast struggling to keep American accents straight in order to give the impression that the film is taking place in Malibu. There are some cheap digital shark effects and even more when it comes to depicting the tsunami. What should be said in the film’s favour is that, while it remains a B shark movie, it is one of the few (possibly only) made around this time that is taking itself seriously and has not planted tongue in cheek and determined to be as ridiculous as possible. As such, David Lister generates fair and reasonable tension. The steps to get everybody there seem contrived, nevertheless the scenes with the cast trapped inside the lifeguard station on stilts in the midst of the flood water and surrounded by sharks that are trying to batter their way in maintains a reasonable pressure cooker situation. There is the inevitable scene where the heroes take to the sharks with chainsaws and buzzsaws.